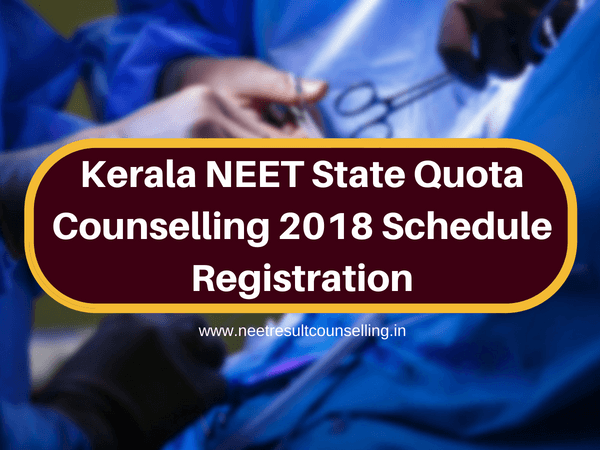 Kerala NEET State Quota Counselling 2018: Kerala NEET 2018 state counseling for filling 85% state quota seats will be conducted in the month of July 2018. As we know that 15% NEET All India Quota seats are filled through a centralized counseling conducted by Medical Counseling Committee (MCC) whereas, admission of the candidates into various medical and dental colleges under 85% state quota seats is done through a state counseling which is conducted by an authority notified by the state government. Talking about Kerala, Commissioner of Entrance Examination (CEE) is the authority responsible for organizing centralized counseling for NEET UG candidates. In this article, you will get all the relevant information about Kerala NEET 2018 State Quota counseling. This information will include counseling schedule, eligibility, counseling procedure etc. *Official schedule for counseling will be updated shortly. Visit the official website of CEE, Kerala. Now candidates have to fill all the required details, upload photograph etc. After final submission candidates have to take a printout of the application form. And lastly, candidates have to send all the required documents along with the printed application form to CEE, Kerala within the given time frame. ST candidates are exempted from fee. The fee can be paid through the e-challan/ internet banking/ credit card/debit card. Candidate must meet all the nativity conditions required for NEET state counseling. Details about nativity are provided in the information bulletin of KEAM 2018 at the official portal of CEE, Kerala. Minimum age of the candidate must be 17 years on and before 31st December 2018. Candidates must have qualified 10+2/HSC with minimum 50% in biology/ biotechnology separately and atleast 50% marks in Physics, Chemistry, Biology/ Biotechnology together from a recognized Board. Candidates must have qualified NEET 2018. Interested candidates have to register themselves for NEET state counseling by filling KEAM (Kerala Engineering Architecture Medical) online application form through CEE, Kerala portal. After the payment of fee and successful submission of online registration, form candidates will be eligible to proceed further. Candidates who have registered for KEAM 2018 have to submit their NEET score for admission in medical and dental colleges of Kerala. On the basis of score of the candidates in NEET exam rank list will be prepared. Candidates are advised to take a printout of the submission report of the NEET score for future reference. CEE, Kerala will publish rank list of the candidates on its website prepared on the basis of NEET score. Candidates whose names will appear in rank list will be eligible for participating in seat allotment procedure which is known as Centralized Allotment Process (CAP). Candidates have to apply through online mode and have to fill choice for their preferred course and college. Finally, seats will be allotted to the candidates on the basis of their preference, reservation criteria and ranks. Candidates have to report to the allotted colleges on the specified date and time to confirm the seat. Admission and seat of the candidate will be confirmed only after the payment of course fee. Printout of the filled-in online registration form. Kerala NEET State Quota Counselling 2018 will be conducted in online mode and will start probably in the month of July 2018. Candidates are advised to read all the instructions carefully before filling the online registration form. Candidates have to carry all the original documents and a set of self-attested copy of all the documents for verification. Candidates must fulfill nativity conditions and qualifying criteria to be eligible for counseling. Candidates are advised to retain a printed copy of registration form for future use. Seats are allotted to the candidates on the basis of the various factors such as NEET score, eligibility, seats available in the colleges etc. Candidates are advised to stay in touch with CEE website to get regular updates about Kerala NEET MBBS/BDS counseling.